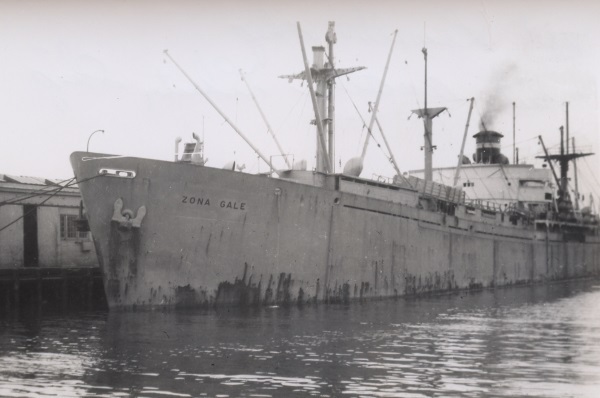 The S.S. Zona Gale was one of the first Army mule carriers to serve UNRRA, June 1945. My grandfather who just passed this past Wednesday served on the Zona Gale. He received his Shellback certificate (equator crossing) November 8, 1944 and his Realm of the Golden Dragon certificate (international date line crossing) on December 10, 1944 while aboard the Zona Gale. He then most likely left the ship when he took part in the invasions of Makin and Tarawa islands as he made his way toward the Philippines. Hello, Bob. First of all, I extend to you my sympathy on the loss of your grandfather. How wonderful that he shared his history with you. I had not heard of the Realm of the Golden Dragon. None of the seagoing cowboys who were on the trips to China have mentioned it in their journals or interviews, but several talked about the initiation into King Neptune’s Court receiving their Shellback status. I’m assuming that the Zona Gale was carrying mules? What was your grandfather’s role on the ship?